A statue honoring Led Zeppelin drummer John Bonham was unveiled on May 31 in his hometown of Redditch, UK on what would have been the late rocker’s 70th birthday. 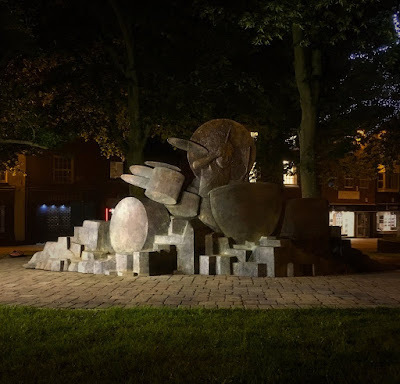 According to the Redditch Standard, the two and half ton cast bronze tribute by sculptor Mark Richards was installed at midnight on Wednesday night in the town’s Mercian Square for the occasion, as planned last fall once the initiative passed at a town council meeting after years of hard work and fundraising by The John Bonham Memorial Fund. Set on a plinth inspired by the legendary band’s 1973 album, “Houses Of The Holy”, the memorial shows Bonham in full flow with hair swirling as rocks out in his glory days. The Led Zeppelin rocker died on September 25, 1980 at the age of 32 after a heavy drinking session before, during and after band rehearsals for an upcoming tour; he reportedly drank 40 shots of vodka in his final 24-hours before choking on his own vomit, causing asphyxiation. The group will launch a series of 50th anniversary celebrations and releases this fall.